Nine-times world champion, Olympic champion and four-times overall World Cup winner, Frank Ullrich was the most feared biathlete of his generation. Showing potential at the age of ten after being encouraged by his father, the young Frank chose a sport that demanded speed and endurance on skis, combined with precision when shooting. 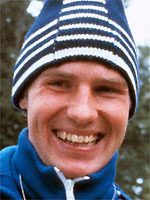 A number of junior titles improved his status in East German biathlon to such an extent that when only 18 he was selected to compete at the 1976 Innsbruck Winter Olympics. The young Ullrich repaid the faith shown in him by helping East Germany to the bronze medal in the relay event. That success triggered a wonderful period during which Ullrich won at least one major medal every winter until 1983, and featured the gold medal in the 10km race at Lake Placid in 1980. It might be said that in the modern era Ullrich's feats have been slightly overshadowed on the domestic level by Michael Greis, the German soldier who won three biathlon golds at Turin 2006 claiming the 20km, 4x7.5km relay and the inaugural mass start 15km event leaning heavily on his impeccable shooting. Sadly, his results tailed off from 1983, partly due to the loss of his wife Silvia, who died in 1982 at the age of 23 after a long illness. It was the second major setback for Ullrich following the death of his sister who had passed away just a few years earlier following a battle with cancer. At the 1984 Games at Sarajevo, Ullrich settled for fifth place in the 20km discipline. Following the unification of Germany, he was suspected (as were many East German athletes) of doping, but the German Olympic Committee cleared him of any involvement, enabling him to continue the coaching role he took up in 1986 following the fall of the Berlin Wall. In March 2009, two former biathletes accused Ullrich of encouraging them to take illegal substances when he was coach of the East German team at the end of the 1980's.